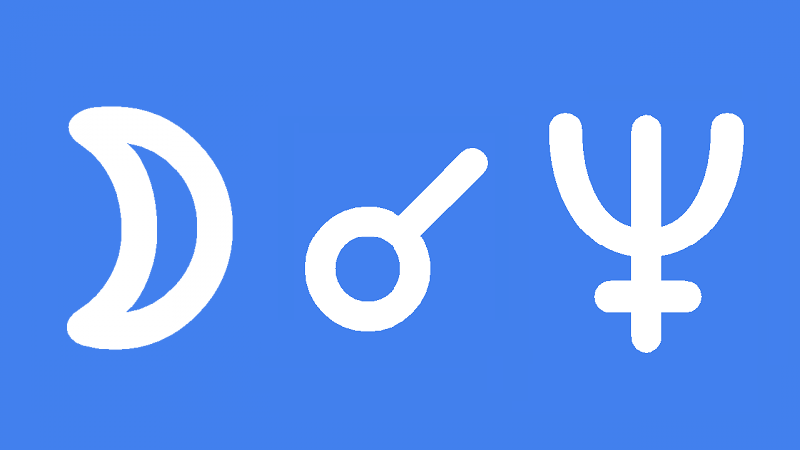 Moon conjunct Neptune in the natal chart causes emotional sensitivity. You are finely tuned to the most subtle of vibrations and this can leave you vulnerable to any disturbance. It seems that you pick up every thought and feeling, every suspicion and slur from all those around you. Filtering out what is true and important is a major task for you. You are easily upset when someone is means or nasty to you. You may cry easily and retreat to your safe place. At this point it is vitally important to understand that everyone faces such criticism, rejection or abuse. You must not let such negative behavior get you down and affect your self-esteem. It is very easy for you to feel victimized, paranoid and dejected. It is probably better for you to have fewer rather than many friends until you are confident about handling negative energy. The best way to handle negative people and situations is to remove yourself. Eventually you will learn your own way of coping so you can handle more unpleasant environments. You will come to see that you have a very special talent which is called being psychic. How accurate your visions or impressions are and how long it takes to master this gift will depend on other factors in your chart. You are also very much appreciated for you genuine compassion and empathy. You are sensitive to the feelings of others and are especially affected by the plight of those cast out by society. Being of service to others is one way to turn your dreams and ideals into something practical. Finding a useful outlet for you ethereal talents is important so you don’t get stuck in a world of delusion, fantasy and lies. Feeling sorry for yourself can lead to more serious problems such as addiction, anorexia and other problems associated with poor self-image. Transiting Moon conjunct Neptune increases your emotionally sensitivity but also your level of confusion. You can sense the thoughts and feelings of others and this can make you feel very uneasy or even ill. You may be picking up the wrong signals so it is better to be cautious because you are vulnerable to deception and scandal. Caution is one thing but delusion is another. Dreams can turn into fantasies with a life of their own and suspicion can spiral into paranoia, guilt and such self-destructive habits as drug addiction and eating disorders. This transit is like a double-edged sword. With some conscious self-awareness you can filter out the background noise and use your sensitivity for good. While some psychic impressions may be off the mark, your compassion and empathy are genuine. You can be of great assistance to the victimized and outcast. The emotional comfort you offer has a healing quality. Apart from charity work you may be inspired to create a masterpiece in art, fashion or entertainment. Your dreams may be extra vivid but challenging to decipher. Romance is possible but remember the difference between fantasy and reality to avoid rejection and embarrassment. You may be exposed to poisons or infectious disease. Hygiene and cleanliness is important now as you immunity may be low. You could be more susceptible to pathogens and the effects if drugs, alcohol and anesthetics. This interpretation for Moon conjunct Neptune transit applies to a lunar eclipse and full moon conjunct Neptune. Richard Simmons 0°07′, Brenda Frazier 0°07′, Ronald Greenaway 0°07′, Edward M. Kennedy 0°18′, Jennifer Gibbons 0°34′, David Essex 0°36,′ June Gibbons 0°37′, Justin Timberlake 0°37′, Dustin Hoffman 0°37′, Greta Scacchi 0°37′, Sting 0°56′, Sean Lennon 1°37′, Charles Dickens 1°48′, Francisco Franco 1°51′, Anne Frank 2°53′.